One of my goals over the past few months has been to build a reserve of quick-prep weeknight recipes made with real food ingredients. Meals that use simple, fresh ingredients with some pantry staples to keep it easy and inexpensive. Perfect for nights when I don't feel like cooking, which happens more than you'd think. That and finally publish my own tried-and-true quick-prep recipes like creamy tomato basil soup, chicken hummus naan wraps, pan-seared salmon with chimichurri sauce, and egg bake breakfast casserole on the blog for y'all to try. I have a horrible habit of fixing an awesomesauce recipe multiple times and sharing it on Instagram but never taking quality daytime pictures for the blog. Oops! Sorry. Last month, at the recommendation of my friend Amy, I signed up for a weekly meal delivery service called Hello Fresh. I've sent my dad & step-mom a week's worth of meals from Sunbasket before, but never tried a service like this myself until now. I figured it was a good excuse to give my brain a break from all the thinking + shopping involved with meal planning. That, and get a dose of inspiration from trying 3 new easy recipes each week. It turns out I was right. After three weeks of using the meal delivery service (my favorite meal was the rosemary-crusted chicken thighs), I felt refreshed and ready to focus on easy weeknight meals. Which brings me to today's recipe for Egg Roll in a Bowl. This is one of my favorite dishes to make when I want a quick veggie & protein-packed meal that isn't fussy but fulfills a craving for comforting Chinese takeout food. What is Egg Roll in a Bowl (a.k.a. "Crack Slaw")? As the name implies, this dish is basically an egg roll, sans the fried egg wrapper. 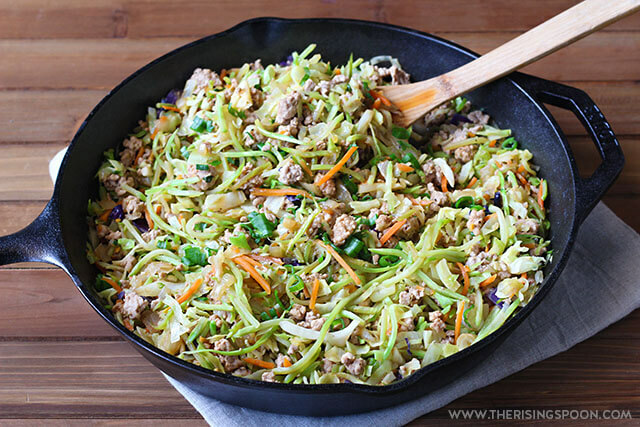 So you serve the cooked filling of shredded cabbage, grated carrot, ground meat (pork usually), soy sauce, and aromatics like garlic & ginger in a bowl instead. That's the basic version of it anyway. 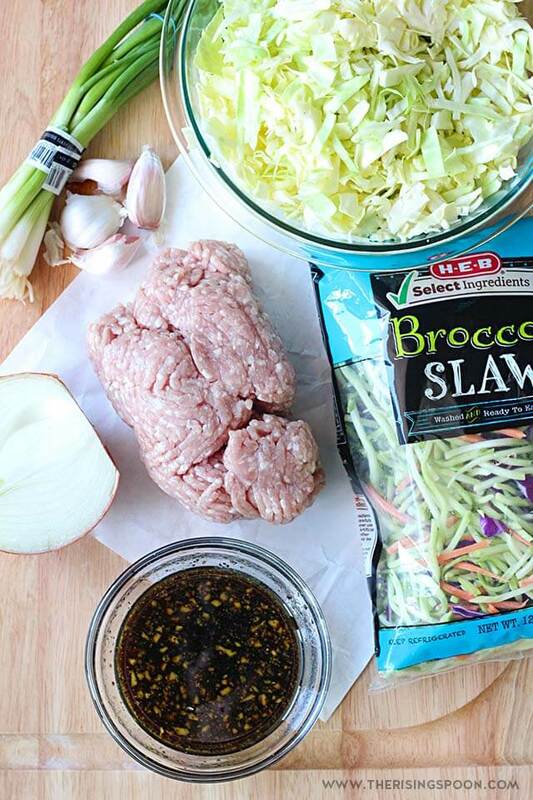 I'm not sure who came up with it in the food blogging world, but it's an extremely popular recipe for the low-carb and Trim Healthy Mama communities & I assume that's where the "crack slaw" name originated. When I first made it last September, I took a quick peek at the versions shared by Buns In My Oven, Whole New Mom, and Peace, Love & Low Carb for inspiration. They're all slightly different, ranging from super simple to more complex with different swaps for special diets. However, I ended up making my own version based on my beef lettuce wraps recipe (the sauce ingredients are similar). 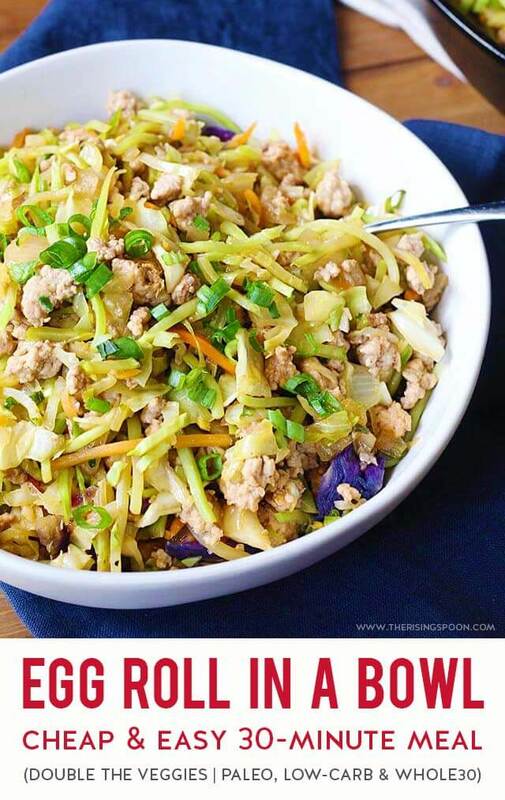 What Makes My Take On Egg Roll in a Bowl Different? Many recipes you'll find on the interwebz for egg roll in a bowl call for cooking oil, ground meat, coleslaw mix, garlic, powdered ginger, soy sauce, and green onion. That's it. Here's the deal...I like things flavorful, saucy, and heavy on the veggies. My version uses broccoli slaw in addition to shredded cabbage, so you get almost twice the amount of veggies in one meal. That makes it more filling and nutritious. And it uses a double batch of umami-packed "stir-fry" sauce (that literally takes 2 minutes to make), half that you add near the beginning and the other half at the end. 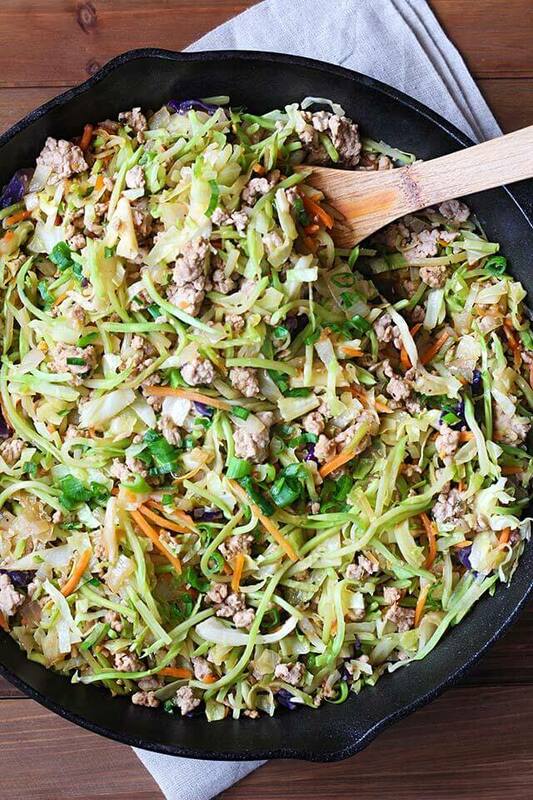 This ensures the ground meat + extra veggies are moist & flavorful and gives you extra leftover sauce at the bottom of the skillet to drizzle over white rice, cauliflower rice, or the filling by itself if you serve it as lettuce wraps. Mine does require a few extra ingredients for the sauce, like rice wine vinegar, sesame seed oil, raw honey, and sriracha chili sauce, but these are foods that have a LONG shelf-life and can be used for a myriad of stir-fry dishes with veggies or noodles. And I think these ingredients make the dish taste so much better than just plain soy sauce. If you don't already have them on hand, I highly recommend picking up a bottle of each. 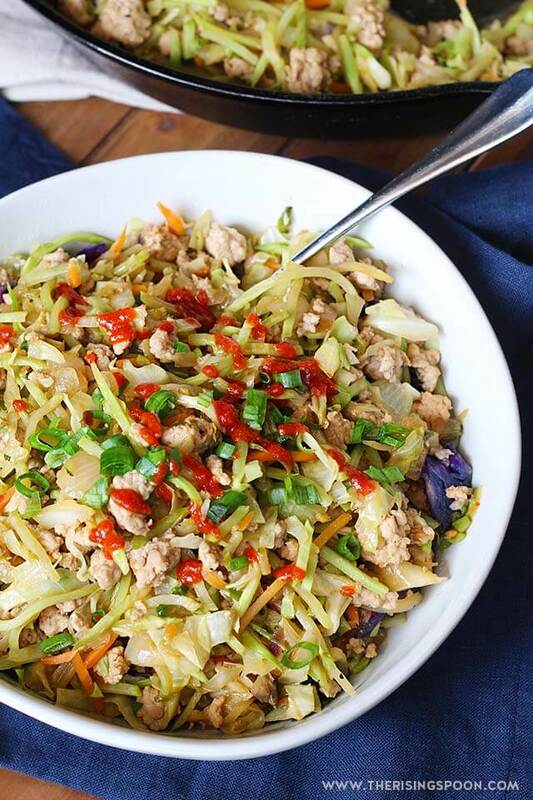 My recipe uses a bit of raw honey to balance out the saltiness of the stir-fry sauce, but this makes it too carb-heavy for folks following a Keto diet and sweeteners are a no-no while you're on the whole30 program. However, it still qualifies as low-carb with only a bit of shredded carrot mixed into the broccoli slaw. SO...to make this recipe whole30 friendly, you'll omit the honey, use coconut aminos instead of tamari or soy sauce & serve cauliflower rice on the side. That's it! Everything else is good to go. For a keto version, either omit the honey entirely OR substitute a small amount of low-carb sweetener like stevia or swerve, and then serve this with cauliflower rice, as well. My recipe makes enough for 4-6 servings (depending on how ravenous you're feeling) so the first night I ladle the stir-fry on top of white basmati rice or cauliflower rice, along with a bit of extra sauce from the skillet (Trader Joe's & Whole Foods both have frozen riced cauliflower you can grab for convenience). The second night, I reheat the filling in a skillet (add a splash or two of water or broth if you want it saucier) and spoon it into bibb, butter, or romaine leaves to make lettuce wraps. Either way, I usually top mine with extra green onion and sriracha sauce since I like a bit of heat. For lettuce wraps, lime juice squeezed over the top is a nice addition. 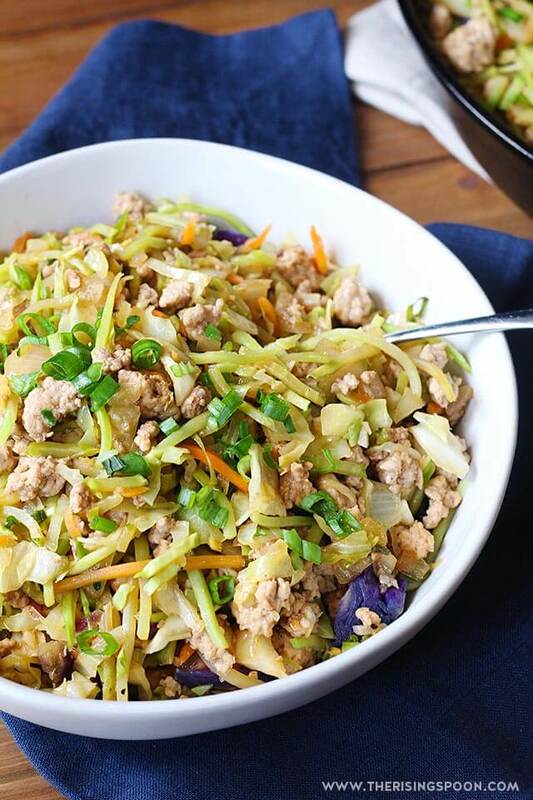 Egg roll in a bowl reheats really well and lasts several days in the fridge, so it's an excellent dish to meal prep early in the week and bring for quick lunches. You can also fry up a couple of over-easy eggs to put on top and serve it as a savory breakfast. In a small bowl, combine all the stir-fry sauce ingredients and stir until the honey is completely dissolved, then set aside. In a large (12-inch) inch skillet set to medium heat, add cooking oil and then the diced onion. Cook for 5 minutes, stirring occasionally. Add the ground pork, sea salt & black pepper to the skillet. Break the pork up into chunks with a wooden spoon and cook about 5-7 minutes, or slightly browned and no pink remains. Add the garlic and cook for 1 minute, then pour in half of the stir-fry sauce (about 1/2 a cup), followed by the broccoli slaw and cabbage. Gently stir (the skillet will be overflowing with veggies at first until they start to soften and shrink down) and cook 5-7 minutes or until the veggies are as soft as you like (some folks prefer them with a bit of crispness, others very soft). Stir in the green onions and the other half of the stir-fry sauce and cook for another minute or so. Remove from heat, ladle into bowls and serve with extra green onion and sriracha sauce for garnishes. Click Here To Pin This To Your Easy Recipes Board!